Speechie Freebies: Speechie Freebies' Edublog Awards 2014 Nomination! Speechie Freebies' Edublog Awards 2014 Nomination! 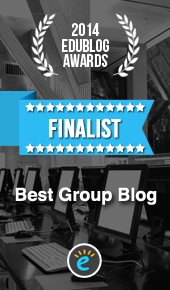 With the exciting whirlwind of ASHA, we almost forgot missed the Edublog Awards! We are honored to have been nominated again this year (2nd year in a row!) for the best group blog! Thanks to all of you for following and supporting Speechie Freebies! We also want to thank those of you who nominated us for the Edublog Awards last year and this year! We are honored and excited to have made it to the shortlist again! This means a lot to all of our authors! Make sure you check out the other nominated SLP bloggers in other categories! Once again, thank you for all of your support this year! Next year, we will try to be on the ball with posting about the Edublog Awards!